I work on people and sometimes I get to work on animals too. This is an extraordinary story of my friend and client, Ozzie…Enjoy! 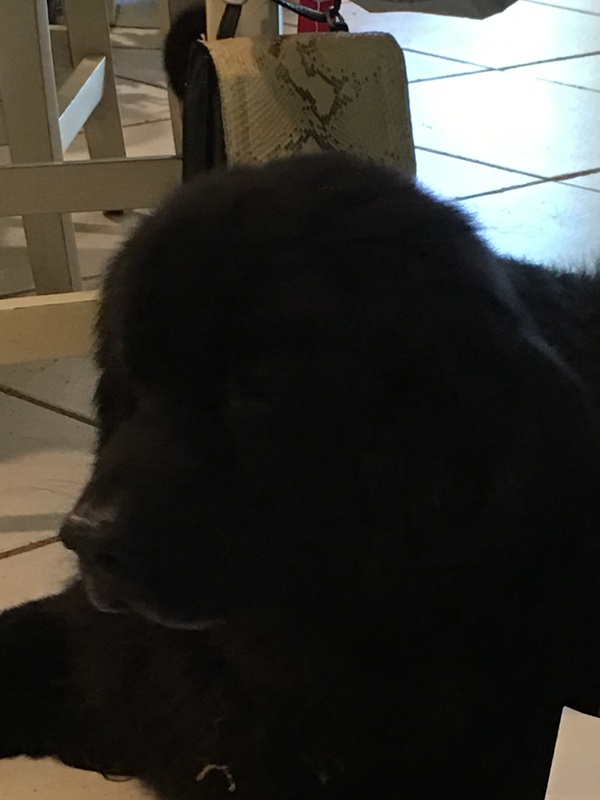 Ever wish you could have a “do over?” A chance to say, “If only I’d chosen a different path.” Well we got that chance with Ozzie, a 7 year old Newfoundland/Labrador/Golden Retriever mix who spent his first 6 months at the Fort Pierce Humane Society. Ozzie has always been a very active, wonderful, “special” dog. One of my college roommates Cyndy and I were talking the other day, describing, if you are lucky, in your life you’ve had a special dog or maybe even two. This is the type of dog who, when you call him from a long distance, looks up as if to say, “Me? Me? Oh are you calling me?? Oh great!!! I’m coming, here I come, I’m so happy that you called me!! I’m running as fast as I can! Here I am!” And lands on your feet in a big blast of fur. A special dog almost has human overtones, and eyes that follow you, a tail that wags continually, and a heart of gold, a dog who wants to do nothing more in life but to please. Ozzie is our special dog. About a year ago, out of nowhere, Ozzie experienced, as our canine Neurologist at The Animal Emergency Clinic in Melbourne described, a stroke on his spinal cord. After a relatively short recovery period, paralysis followed by weeks of physical therapy, he bounced back to an almost normal gaited dog, which is relatively common in the recovery with this diagnosis. Oddly 6 or so months later, he very quickly began to lose the use of his legs and began “knuckling” on his front legs. Within 2 days, he was back at The Animal Emergency Clinic, completely paralyzed. The wonderful doctors at the clinic who I adore, explained that Ozzie now had a combination of significant problems with his spinal cord, not only one diagnosis this time and surgery was then performed. After the procedure, unfortunately Ozzie did not function well, he did not respond to much of anything, he was very lethargic and continued to be paralyzed. It was at this point that I knew that I should probably face having him put to sleep. As I looked into his eyes while they followed me around the visiting room when I’d make the daily trip up to Melbourne from Vero, I questioned myself if the time had come. It was crushing to have to leave him at the end of each day to return home, but after a week of zero improvement I wondered if I was making the right decision to keep him alive. However, the option to take him home after a very weak but positive response to a toe pinch reflex test made our decision easy. Our family of one husband and two teenage college bound boys and I, made that decision despite the fact that the prognosis was both guarded and poor. 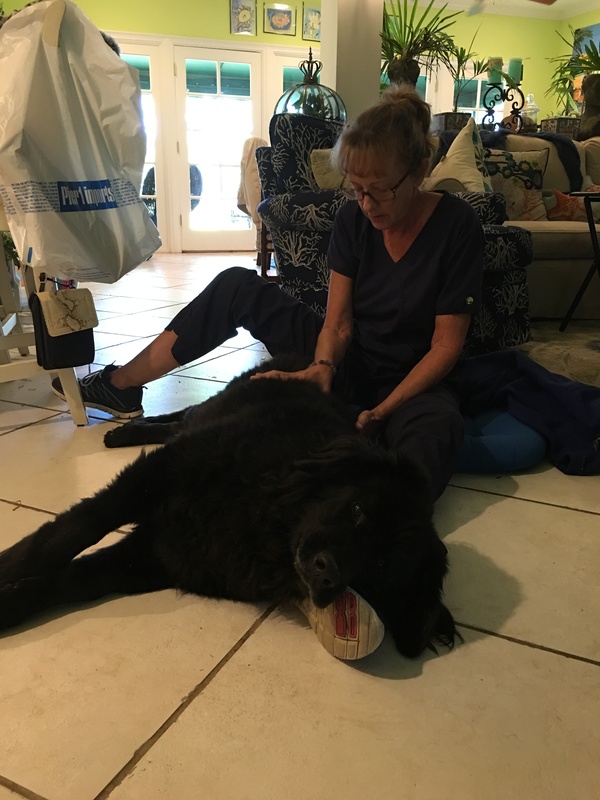 The process of recovery was very bleak; that he may never recover, never gain the use of his legs or walk, and that we would be dragging a 90lb dog outside several times a day. And if he WAS able to recover enough to walk, that it could take up to a year or more. Enter Penny Michaels. I was given her name by the famous Pawprints Doggie Daycare, (I’m sure half of Vero goes there), by owner and friend Kim Conte. Kim knew Ozzie’s plight since she and her husband Sean oversaw Ozzie’s water therapy, who had now gained enough strength in his neck to at least hold his head up, as we floated him around in a pool. After explaining that she’d had great experience with Penny Michaels in the past, a physical therapist not only on humans, but also dogs, suggested I call. Calming, knowledgeable, confident, inspirational, and super friendly are probably the words I would use to describe Penny. Immediately I wanted to sign Ozzie up. She described the therapy that she used as “Bowen Therapy,” (which I was not familiar, but that did not matter), as basically working with the Central Nervous System, without the use of drugs. She mentioned that it was very common in the horse world, but not yet in the world of dogs, but should be. 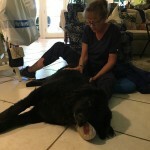 I felt so comfortable with Penny’s patient personality as I described Ozzie’s conditions that I was very anxious to begin physical therapy immediately; which I did. 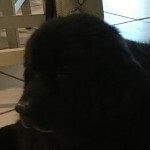 I began noticing improvement beginning the week of the first therapy session with Penny. Ozzie began turning his head more and he seemed to be much more responsive to stimulus. By week two, he was beginning to lunge around on the kitchen floor using his shoulders. He’d scoot to his super dish even though it was only 6 inches away. Ozzie was so dedicated, when Penny came to our house for his therapies with him, he’d put his head in her lap, ignoring me, almost as if he knew she was helping him to the road of recovery. On about the 3th to 4th week, Ozzie would try and push up on his back legs although his front legs were not cooperating. When we brought him home after the surgery, his front legs were as stiff as boards and stuck out completely in the air when he was lying down. His front legs buckled as he tried to put weight on them. During each session, Penny would say, “Okay, now I’m going to be working on his front end, (or back end, or neck or shoulders, etc), so watch for any movement there,” she’d always give me an idea what to look for and then ask for videos. By the 7th to 8th week, Ozzie was walking. He was knuckling, (the foot part of him bending) about ½ the time and walking the other half, but walking. It was incredibly exciting to see him get up and walk independently. Ozzie is now walking, we’re in week twelve. He continues to improve. He walks outside, eats, drinks, watches squirrels and just seems to really be enjoying life. If he’s thirsty, he walks over to the fountain for a drink, if he wants to cool down, he walks over to a shadowed area in the rocks beneath an oak tree, when he wants to come inside, he walks back in. I think back with a lump in my throat the size of Texas about how close I came to putting Ozzie to sleep because I thought it was the time and I didn’t think that there were any other options. With the prognosis I was given at the time, that he’d probably never walk again, and if he did, possibly a minimum of a year to see any improvement if at all, I wondered what kind of life that would have been for him. When Penny came for the first visit, I’ll never forget, she said, “Oh, he’ll walk, it’s just a matter of time.” It’s such a shame that more dog owners don’t know about Bowen Therapy and therapists like Penny. So many dogs’ lives and families would have such different outcomes; like ours. I came so close. But I had a do over. I was one of the lucky ones. This entry was posted in Uncategorized on April 18, 2016 by penny michaels.